Western Sydney University has joined a strong and united stem cell community to welcome $150 million in Federal Government funding, over the next ten years, towards research into new ways to treat congenital heart disease, blindness, stroke, dementia and kidney disease. New research led by THRI Biostatician Dr Haider Mannan suggests that infants in South Western Sydney introduced to formula and solid foods within the first four months, could be twice as likely to suffer from childhood obesity. Dr Olayide Ogunsiji has been awarded the inaugural Highly Commended award at the 2019 Blacktown Woman of the Year awards in recognition of her significant contributions to the health of migrant and refugee women and girls in the Blacktown City Council area. 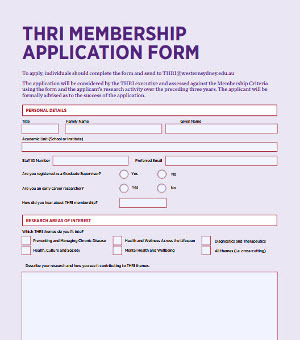 Interested in becoming a member of THRI? Find out more about THRI membership.